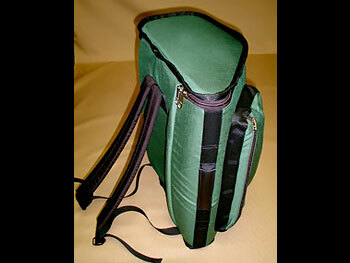 Our soft Accordion case is made with our standard materials and is custom fit to your instrument. The Accordion “end loads” into the case like binoculars. Our Accordion case is well padded and has a leather carrying handle as well as padded backpack straps. We use #10 YKK zipper with 2 nickel zipper pulls for strength and durability. There is a zippered, pouch pocket that rides on the space between the keyboard edge and the grill. In addition to our standard dense closed cell EVA foam we laminate a soft open cell foam from the grill, across the bellows to the bass keys. A tracing of your accordion shape and keyboard length is required.